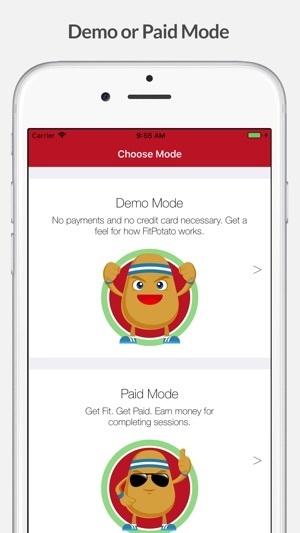 Challenge friends and other FitPotato users to earn cash for steps. Join a weekly prize group, complete 3 sessions in 7 days to win. Choose from walking, running or dog walking. Whoever has completed all 3 sessions by the end of week gets a share of the weekly prize! If you are the only winner, you win the entire prize! Back yourself. Get Fit Get Paid. Is your fitness routine getting boring? Are you lacking motivation and finding it hard to stick to your goals? 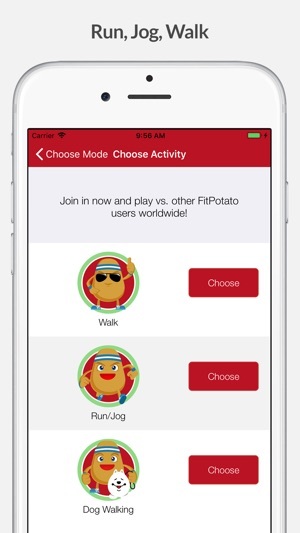 Make fitness fun again with FitPotato. Challenge your friends and get fit together. Complete all your sessions and win a share of the weekly prize. If you are the only person to complete all sessions, you win the entire prize! 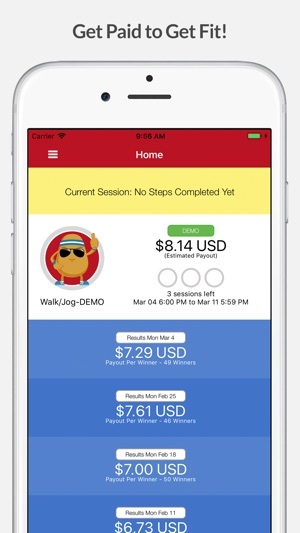 To be able to track your steps, FitPotato requires access to Apple Health Steps data. For the duration of your workout, FitPotato uses your GPS in the background to track your session. Continued use of GPS running in the background can dramatically decrease battery life. Customer service is fast, responsive and helpful. I really like the little potato guy visual and the distance needed to earn a checkmark is pretty minimal. The app can be glitchy and shut down mid work out though, and it loses connection sometimes yet that is counterbalance as I said by wonderful responsive customer service. I usually can get my workouts to count anyway. I also wish it worked better when you have other apps such as MapMyRun going, so be aware of that, because that can cause steps not to count. It is one of the easiest ways to earn money I have ever experienced, though. The developer and customer service team are pretty upfront about these potential issues, which helps the customers use the app affectively and I appreciate that aspect of the service. I would definitely recommend this app. Thank you for taking time to leave us a review and for the feedback. We are really glad to hear you are enjoying the app. 👍👍👍 Our team is working on improvements which should resolve gps issues very soon! Earn while you get healthier! I’ve been using FitPotato for a couple years now & I’m so happy to have found this app! They’ve made improvement changes over time & I’ve never been disappointed. Their customer service support is always responsive and friendly. I recommend this app to everyone, including my family and friends to join & stay active! PK Coin - Earn for Workouts!